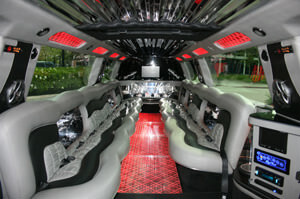 Beautiful, luxurious, affordable limos in LA! Get the party on the road! LA is vibrant city and there's never a dull moment. Celebrations, entertainment, and culture engulf every inch of the city. If you're in need of luxury transportation and you live in or near LA, then give us a call! We have a diverse fleet of top of the line party buses and limousines that can accommodate any number of passengers.. All of our vehicles are kept clean and have beautiful, professionally built interiors with an impressive array of features and amenities. Furthermore, you can rent any member of our fleet for any event, 24/7 and our chauffeurs will get you to your destination with ease. We can take you across the Los Angeles County and surrounding counties, including Orange County, Ventura County, and San Bernadino County, just to name a few. You might think such great service is out of your price range, but you'll find that we offer the most affordable prices in the region! With our reputable service, lavish vehicles, 24 hour availability, and affordable prices, it's no wonder we're the region's favorite limousine company! Interested? Give us a call or keep reading to learn more. Your satisfaction is paramount. When you choose us you choose to treat yourself to the best. We pride ourselves on being a company that puts customer satisfaction first. Before all else, we care about customer satisfaction and we'll do our best to make sure you're happy. We have agents available 24 hours per day to answer your calls and emails, so any questions or concerns you may have can be addressed when you want or need them addressed. In addition, our chauffeurs are the best in the business, so you can rest assured that you'll reach your destination safely and on time. 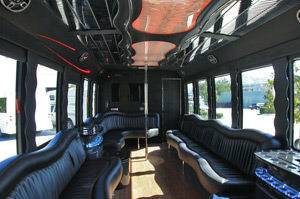 We're proud to have the finest LA limos and party buses. We've already mentioned the custom interiors and wide array of amenities, but just what are those amenities? Each vehicle in our fleet offers comfortable leather seats, beautiful lighting effects, built in bars, booming stereos, TVs, DVD players, CD players, and more! 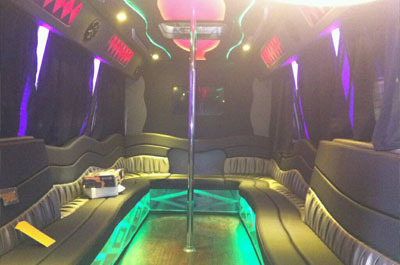 If you're looking to dance, opt for one of our buses which also include dance poles. You can enjoy any variety of these features - drinking and dance, movies and music, or just relax and enjoy the colorful lights! If you'd like more specifics just give us a call! There's no better way to travel! Your California celebrations will never be the same after you've been touted around town in one of our great limos! But aside from being the fun way to travel, it's also convenient. Imagine you're hitting the town with 15 guests - arranging the transportation on your own would be added stress. How many designated drivers will you need? Do the friends who agree to DD have big enough cars to transport everyone? Does everyone know how to get to the venue? When you have a luxury vehicle at your service you can all travel together, you call enjoy drinking - even on the vehicle - and you'll all arrive together. All you have to do i shop on board and get the party started - no stress! You can enjoy the convenience of our transportation for any type of celebration. Weddings, birthdays, bachelor and bachelorette parties, concerts, LA Lakers, Dodgers, Clippers, or Kings games, golf outings, wine tours, corporate events, sight seeing, trips to Universal Studios, and so much more! No matter where you're going, get there in style. Our prices will surprise you! We believe that luxury transportation should be available to anyone celebrating a special event so we make sure to keep our prices as low as possible. Our pricing is based on several different factors that we set and varies depending on factors you set. We, of course, set our prices based on things like our operating costs and more specifically on your rental needs - the size of the vehicle, the date, time, and length of your rental. You'll find that we don't inflate costs or add any hidden fees at the last minute. With us, you can simply count on reliable, luxurious transportation. Getting a quote only takes a few moments over the phone. The process goes as smoothly as possible when you call our customer service representatives. They'll walk you through the process of ordering the transportation that you need. Not sure what type or size vehicle will best suite your event? Let them know and they'll be able to help - they're great at figuring out what you need before you even need it. When you're ready, just give us a call or send us a quick email! We can't wait to hear from you!